As someone who has been in the wine trade for many years, I’m privy to plenty of special experiences… wine dinners, library tastings, chef-prepared lunches, etc. Most of the time, these sweet gigs aren’t accessible to the general public. Which I’ve always thought a frickin’ shame. Why shouldn’t a winery provide as much fun to the social media evangelists who sing praises as much as the guy who recommends the wine at a shop? But that’s how the game is played. At least for now. Getting behind the velvet rope isn’t a problem at Franciscan Estate Winery in Napa Valley. They’ve recently launched the Reserve Lunch program at their winery in St. Helena, California where you’ll be the VIP you know you are. 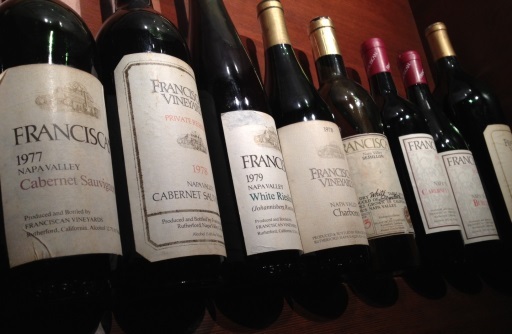 A three-course lunch paired with Franciscan wines, this is an intimate experience limited to only 10 people every Friday. Franciscan’s Chef Andrew Fontaine creates a different menu each week, sourcing ingredients from local farms which highlight the best qualities in the wine, married with the ingredients. The lunches take place in gorgeous private rooms inside the winery and can accommodate many different sized groups. Be sure to visit the library wines before lunch. 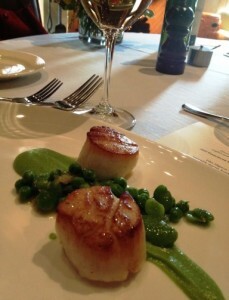 On a Friday in late March, I enjoyed seared Diver Scallops with fresh English pea puree and fava beans, paired with 2012 Fransican Chardonnay; filet mignon in a rich Bordelaise sauce with vegetable ragout, paired with 2008 Franciscan Magnificat; and, to finish, a decadent peanut butter marquis dessert with cocoa streusel and candied peanuts. The portions were ample, the wine pours generous and the meal is most definitely worth the price. I got up from the table impressed, full and eager to spread the word about this new winery experience. This could be yours if you reserve at least one week in advance. But hurry… once the word gets out about this, they will book up fast. It’s that cool. Each Friday, noon – 2 p.m.